This large Kazakh tribal jewelry ring was handcrafted in Central Asia to capture the essence of ancient pieces. Large ornate Afghan jewelry elliptical ring. 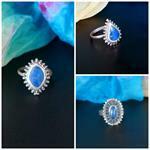 Afghan Tribal Jewelry Ring - Domed with Lapis Lazuli center stone. 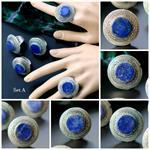 Ornate Afghan Laghmani tribal jewelry ring...Large-sized and beautifully handcrafted with Lapis Lazuli. Ornate Afghan Laghmani tribal jewelry ring with 2-finger band...Large-sized and beautifully handcrafted. Ornate Afghan Laghmani tribal jewelry ring...Large-sized and beautifully handcrafted. Ornate Afghan Laghmani Match-Makers ring ...Large Sized beautifully handcrafted. Vibrant red beads and clattering bells on this large vintage Kuchi Tribal Crown Ring. Set of 3 contemporary tribal jewelry Kazakh rings. These are large domed 2-finger Rings. This lot includes 4 large contemporary Kashmiri tribal jewelry rings with red and green agate stones. This lot includes 3 large contemporary Kashmiri tribal jewelry rings with turquoise agate. This lot includes 3 large contemporary Kashmiri tribal jewelry rings with lapis lazuli. This lot includes 5 large contemporary Kashmiri tribal jewelry rings with ornate designs. This lot includes 3 large contemporary Afghan tribal jewelry rings with Turquoise agate stones in ornate double settings. 2 sets are available, please see images. You will receive exactly the set pictured. This lot includes 5 large contemporary Afghan tribal jewelry rings with Lapis Lazuli stones. 2 sets are available, please see images. You will receive exactly the set pictured. Wholesale only. 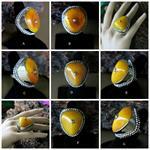 Giant-Sized contemporary Afghan tribal jewelry carved Ring -Selection. Price is for one ring. 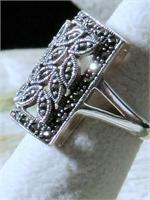 Great looking contemporary tribal jewelry ring from Istanbul Turkey. Great looking contemporary gypsy-face ring from Istanbul Turkey. Great looking contemporary archery ring from Istanbul Turkey.